Teacher of Hebrew and German in the Jewish school of Prague during the first half of the nineteenth century. 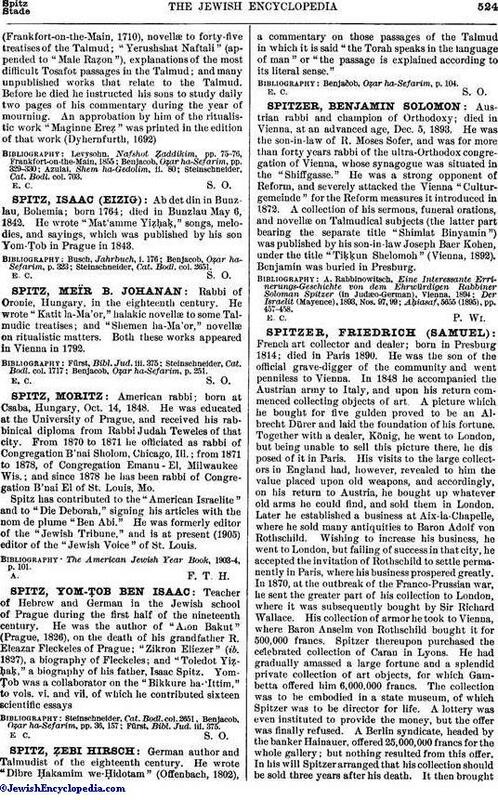 He was the author of "Alon Bakut" (Prague, 1826), on the death of his grandfather R. Eleazar Fleckeles of Prague; "Zikron Eliezer" (ib. 1827), a biography of Fleckeles; and "Toledot Yiẓẓaḳ," a biography of his father, Isaac Spitz. Yom-Ṭob was a collaborator on the "Bikkure ha-'Ittim," to vols. vi. and vii. of which he contributed sixteen scientific essays. Fürst. Bibl. Jud. iii. 375.